We don’t know whether you’re checking out Alia Bhatt’s Instagram or not, but if you’re not - you so should! This girl is giving us some serious hair goals with her amazingly wondrous braiding styles! 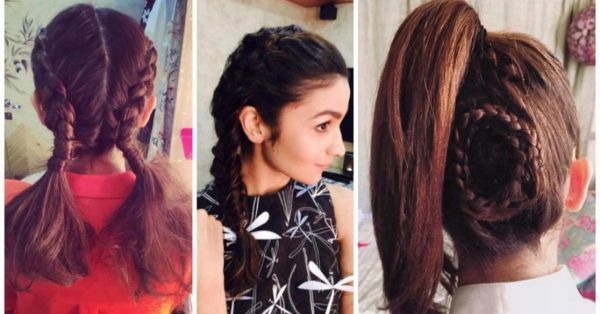 Here are some hairstyles of Alia Bhatt we think you should definitely try! Also read: 6 Beautiful Braided Hairstyles For The Long-Haired Girl! 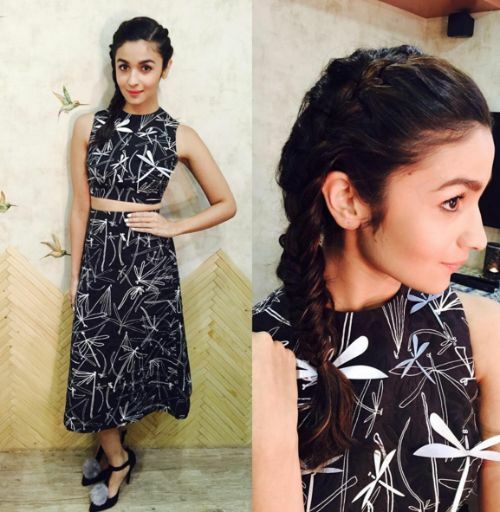 This Alia Bhatt hairstyle is so casually elegant! And pairing all that elegance with a quirky comic book logo...haha, that’s pure genius! Here, Alia uses a simple two-strand braiding technique to create a plait, which she then uses to tie up half of her hair, leaving the other half cascading like a sweet waterfall. The rope braiding technique involves using only two strands of hair, which are twisted and turned over each other - so it is a super simple technique. Learn how to do this hairstyle of Alia Bhatt in a Popxo video here! Also read: Two Quick And Pretty Ways To Braid Your Hair! 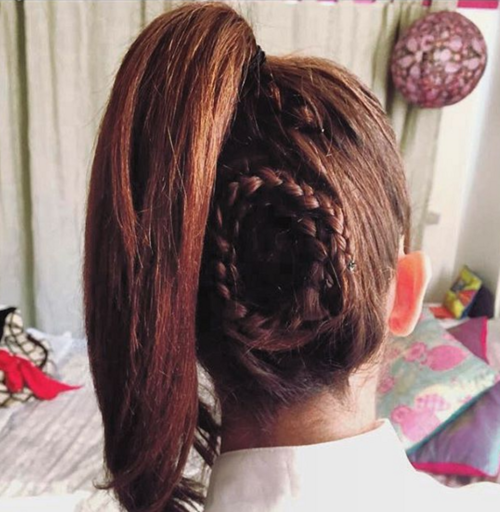 What could be simpler and more creative than this amazing Alia Bhatt hairstyle? This hairstyle of Alia is quirky and fresh at the same time. And not all complicated as it looks! First, tie a high ponytail with most of the hair on the upper part of your head. Then take the remaining section of hair below it, and create a three strand braid and tie the end of it with a rubber band. And then, whirl it round and round and keep it in place using U pins and bobby clips in the back of your head. You’re all done, Girl, you look so cool! Also read: 7 Hairstyles To Suit EVERY Type Of Face! How pretty and romantic is this braiding style - just perfect for your date night! Part your hair in the middle, and then just separate small sections of hair from the upper back of your head to create two simple three strand braids. Then bring them around your head from either sides of the parting in a heart shape and tie their ends together. Hold the heart shape in place with U-pins and you’re all set to step into your fantasy world! Also read: #GetTheLook: How To Perfect the Fishtail Braid in 5 Minutes Flat Of course, there’s the ever-charming fishtail braid which Alia sports with grace. Fishtail braids are achieved by separating the hair into two sections (instead of 3 like with a classic plait) and taking the outer edge of one section and crossing it over to the other side. 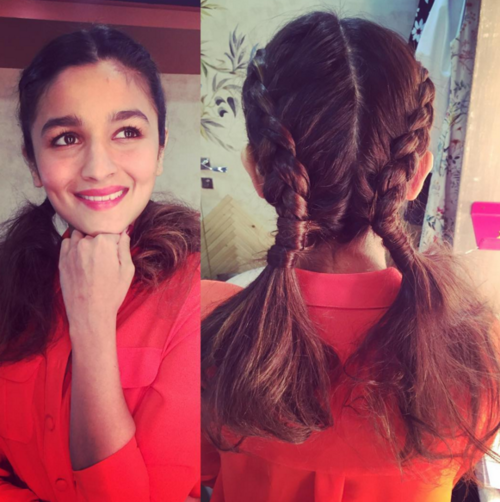 You can repeat this on both sides continuously to get Alia’s hairstyle look. It is also a great idea to “pancake” the braid, which means loosening it a bit by gently tugging at it with your hands after you’re done tying it up. This will give it a more natural look. Also read: FAB Celeb Hairstyles To Inspire You – No Matter What The LengthHair Jazz up your traditional attire with a fun crossed braid- Alia shows you how! Here, the rope braiding technique is used in a small portion of Alia’s hair, which you can try so easily too! Rope braiding involves taking two strands of hair and twisting and crossing them over each other to create this cutesy look. Check out this video to learn exactly how to do this Alia Bhatt hairstyle. Also read: 7 Amazing Hairstyles That Can Make Your Face Look Slimmer! 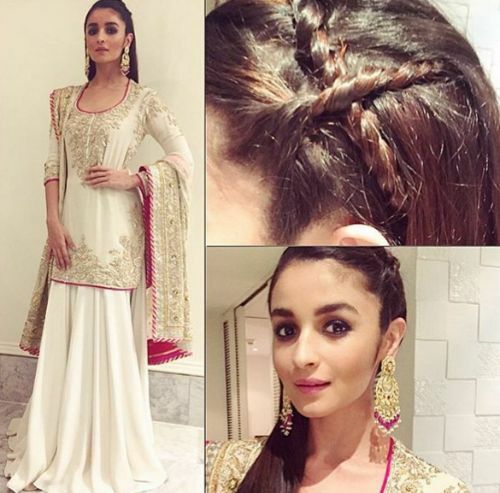 Alia wows with this boho chic hairstyle, which she pulls off with the effortlessness of a true free spirit. 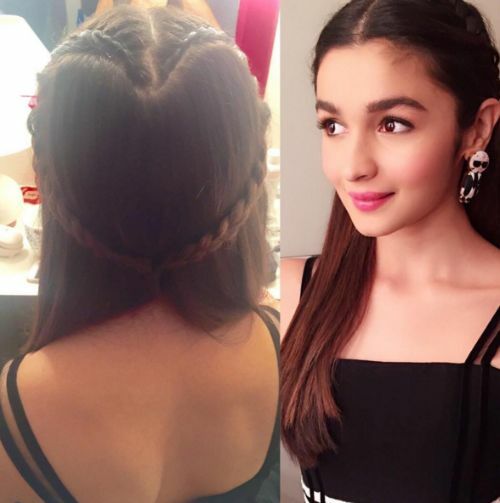 This hairstyle of Alia Bhatt combines the rope braiding technique with the fishtail technique. Take two sections of hair from either side of your head, and rope braid each of them till the mid-length of these sections, and then knot them together, or tie them up with a hair tie. Then use the remaining hair from both these sections to create a fishtail braid. And you’re all ready for your retro hippie-themed party! Also read: Tuesday Tutorial: 4 Simple Steps For The Classic French Braid! This Alia Bhatt hairstyle is perfect for a lazy day, because even though it looks sophisticated, it is actually rather simple to make. And it will look super pro for that busy day at work, even when you’re tired! Check out this Popxo video to learn how to do this hairstyle of Alia Bhatt. Images: Alia Bhatt on Instagram HAVE A STORY IDEA FOR POPxo? If you want to hear about it, we can write about it! Just tell us your idea here!